SharePoint doesn't provide a way to compare dates against the current day's date. Infowise allows you to easily create this field and make it update dynamically using a smart action. In your list settings create a standard SharePoint "Date and Time" field. Use the standard default settings for the field. Create a new smart action to update the field value. Use the timer event setting to have the action run once each day. Hide the field from users since this is triggered automatically. 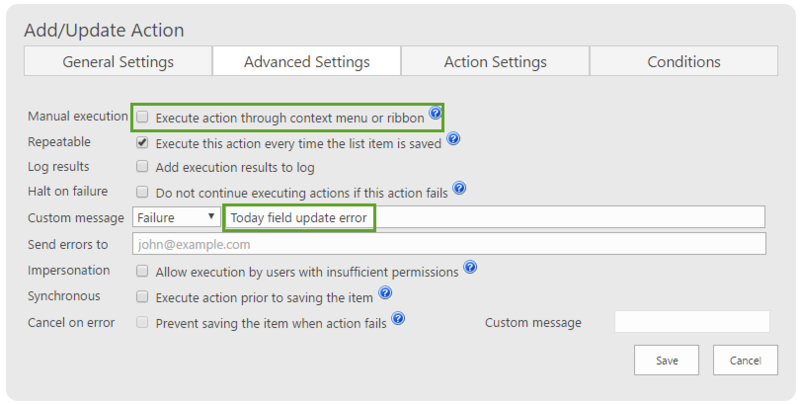 Set the custom "Today" field to the current day by using the SharePoint "[Today]" function. Use the standard "ID equals [ID]" action. Normally you might have to use a custom workflow created in SharePoint designer or some other work around to dynamically check the current date. Infowise allows you to create a dynamically updated field that is critical for date comparisons which can be used as KPIs or to trigger other smart actions.